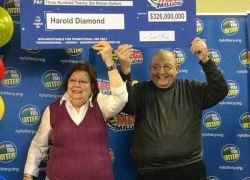 The Mega Millions lottery game has added an extremely rewarding twist to Harold Diamond’s retirement. The 80-year-old Wurtsboro resident has picked up his $326 million jackpot at the gas station where he purchased the lucky ticket. Diamond opted to receive the payment as one lump sum which after taxes comes to $130 million. It is the largest cash prize ever won since the New York Lottery started in 1967. Diamond bought the Mega Millions ticket at a Middleton-based gas station. He and his spouse were on their way to Middleton when they decided to lunch at the establishment. Diamond seized the opportunity to buy a few Mega Millions tickets. The former school principal kept the entries in his wallet, and the next day he remembered them when a friend said something about the lottery jackpot. That prompted Diamond to check his tickets. “I was just thrilled, words couldn’t explain it… I felt like I’ve flown to the moon and back”, the 80-year-old noted. Diamond said he isn’t sure what he will do with the jackpot, but his family will definitely benefit from the bumper win. Additionally, the pensioner plans to donate some of the cash to his beloved town. This latest win proves once again how rewarding lottery games can be. Fortunately, Mega Millions tickets are also available in India through the online lottery ticket concierge service.